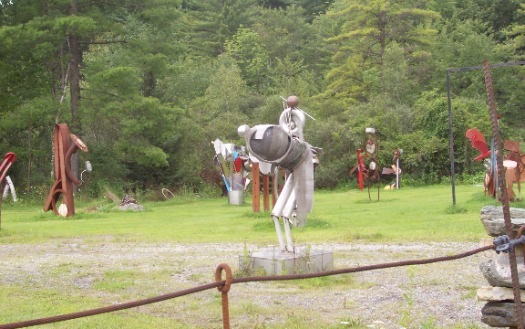 The Circle Museum in Columbia County is as an odd little collection of metal sculptures. 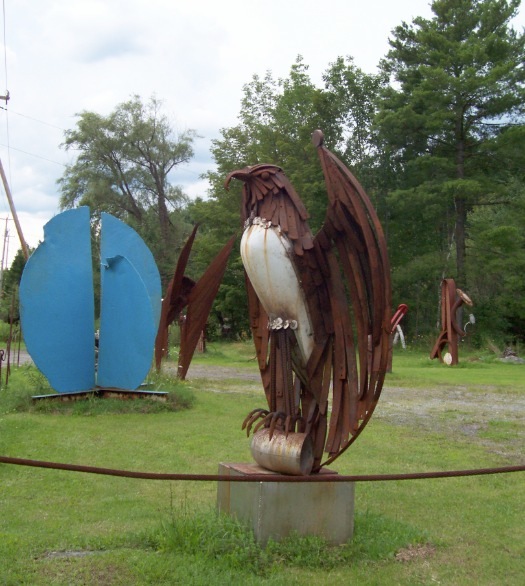 Visitors are welcome to stop by and wander in and around the outdoor sculpture collection. Some of the pieces are fairly straightforward, while others are a bit abstract. Either way, it makes for a very cool little stop along your journey. Why? Isn't the real question here "why not?" 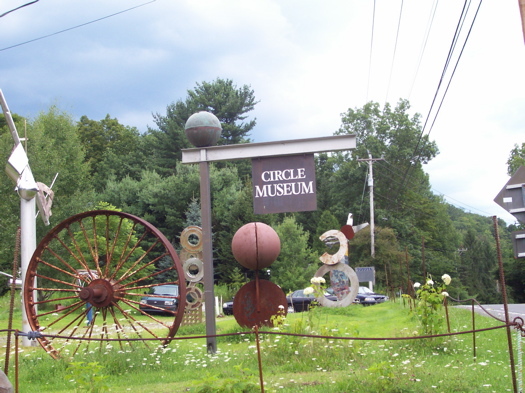 The Circle Museum is a registered Columbia County Museum consisting of over 100 large-scale works of sculpture. In this location for 25 years, BIjan Mahmoodi is the owner of the museum and the artist. His art reflects his fascination with hard-to-find Industrial Era fabricated metals and bronze casting. Inside the artist's studio, also on the property, is a collection of Bijan's oil paintings that explore the circle motif you see in most of his sculptures. Why is it called the Circle Museum? Bijan explains.... "Because our planet is based on the circle - the sun, the planets, the moon and life itself is cyclical.The circle is what inspires me." Dumping metal stuff on your lawn now constitutes Art? I've got an old refrigerator and freezer I'm not using. I think I'll open the Rectangle Museum. @Ellen: We're totally at the opening for the Rectangle Museum. There was a guy up near Northville, right off of Route 30 before town, who ran a art park on land next to his rented old train depot..... I think his name was Faust, he was from NYC I believe. I know his lost his lease and the park isn't there anymore. This stuff is really cool and very similar to his. I wonder if anyone has pictures of Faust's work? Ask and ye shall receive. http://www.artnsoulinc.com/artists/cfaust.htm. I know this thread is old, but my husband and I visited the Circle Museum on Oct. 6, 2008 and I just posted a video of it if anyone is interested. It's a tremendously interesting place if you get a chance to visit! The Circle Museum hosts a generous collection of abstract and figuratively abstract sculpture. I had an opportunity to visit a few weeks ago- and i was blown away by the artists originality and authenticity, especially in regards to material usage and concepts. By no means is this "...metal stuff on your lawn," as mentioned in an earlier posting. It is without question: Art. In every way. If you're passing by I highly recommend a visit to this avant guard park, it is a museum without walls. Bravo! I knew Bijan 20 years ago and still have one of his original art tables - does anyone want to buy it for $15,000? 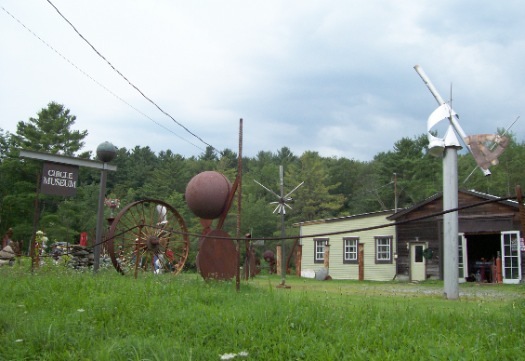 I have visited this place many times after discovering it on a scenic trip from Scranton, Pa. to New Hampshire. I just love how randomly it appeared by the side of the road. Magical. More metal dreams -Sculpture artist around Albany NY. Does anyone know if there's a site where I can view his paintings? I got to know him for a couple of years back in the mid-80's and ended up moving to KY. It's wonderful to see how things have taken off. I would love to see if he would ever make something as small as windchimes. After driving past the Circle Museum for many years, we finally had the opportunity to stop and check it out today. Bijan was very welcoming. A true artist. Fun, intriguing, and definitely worth a stop. Will certainly visit again and hope to own one of his pieces some day.